The Probe Ultra Box range is a great new addition to the Probe Locker range. Offering strong, durable, plastic lockers which are completely rust proof, vandal resistant, flame retardant and come with a 10 year guarantee. 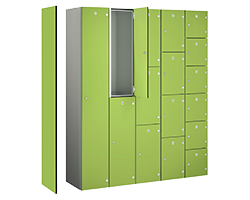 With the choice of water resistant indoor lockers or the Ultra Box Plus+ range for outdoor use and the most extreme conditions - they'll be sure to meet your requirements.